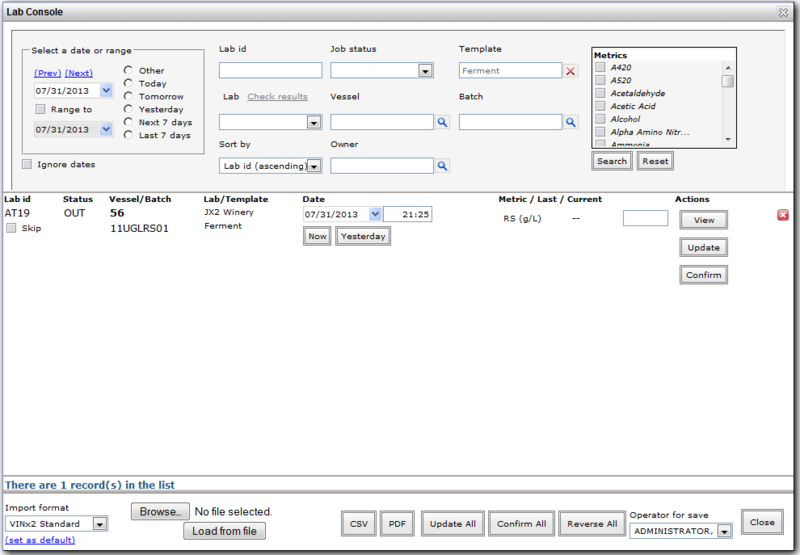 The ferment console centralises the management of all Alcoholic and Malolactic ferments in the system. It is accessible via the Consoles menu and then by clicking Ferment. The Ferment Console has a number of controls at the top to provide a filtered list of ferments. By default, all wine products currently in a fermenting state for the selected vintage are shown. You may start a new ferment (without producing a cellar note/work order) by clicking the Start a new Ferment button on the Ferment Console. Alternatively, you may locate the wine product in the Product Overview and click (Start) link next to the ferment stats from there. The Start ferment window is displayed. 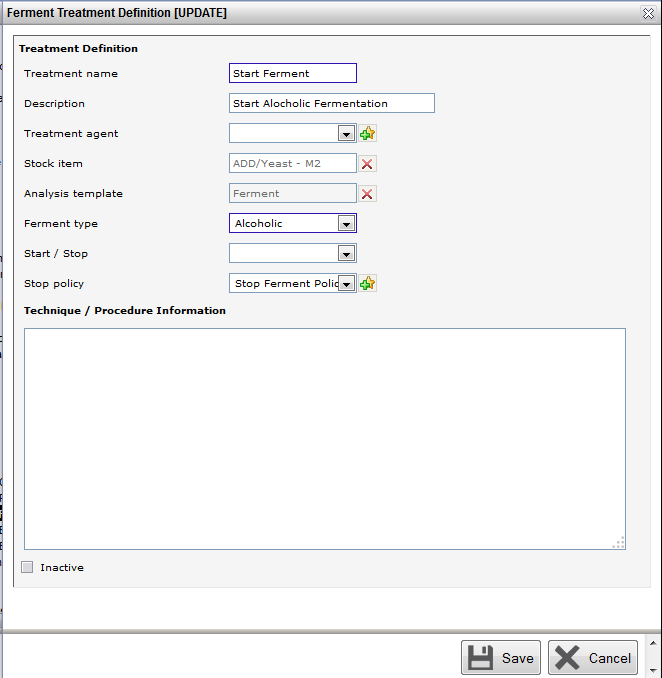 Stop policy – you can configure a stop policy to prompt the user to stop a ferment when recording an analysis where certain values are met. For example, you may configure a stop policy where residual sugar is being tested and is less than 2.0. Click the New button or configure the policy under Winery Setup – Policy – Metric threshold. See Stop Ferment section here. 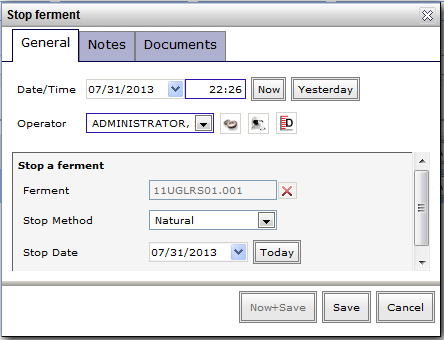 Click Save and the ferment will be started for the wine product – accessible from within the Ferment Console. Please contact us for assistance in configuring your yeast additions if you are at all unsure of the following steps. You can a link a Start Ferment treatment to your yeast additions. This will automatically trigger the alcoholic fermentation of the juice in vintrace when the addition is made. You may also configure a separate treatment to start your malolactic fermentation and link this to your malolactic bacteria. A start ferment treatment can be configured under Winery Setup – Treatments – Treatment (Ferment). Once your treatment is configured link this into the Cause treatment field on your additives under Winery Setup – Production – Additives. 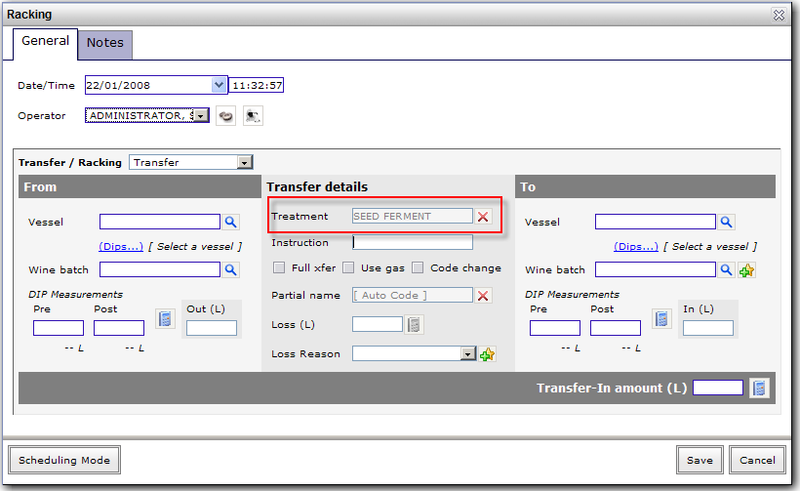 vintrace allows you to seed the ferment of a wine product when transferring a fermenting wine to another wine product. Assuming the source vessel contains a fermenting liquid, the transfer operation will ask you to confirm the ferment state (for alcoholic or malolactic) of the resulting blend. In order to make the purpose of the operation clear to your cellar hands we recommend that you configure a ferment treatment called SEED FERMENT and select this on the Transfer/Rack/Blend window. 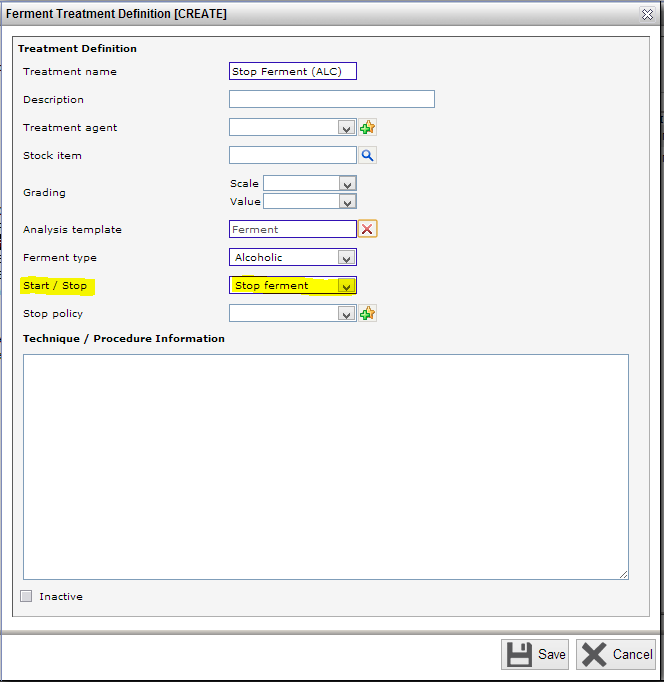 Custom treatments are configurable under Winery Setup – Treatments. As a second alternative, if you don’t want to actually record the starter/culture as a transfer, you may use a Start Ferment treatment for malolactic fermentation. This is of particular help during a barrel down (Transfer to Barrel Group). You will need to set up the new treatment in Treatments (Ferment). You can then use this treatment when barreling down rather than using the starter in a transfer sense. We also recommend that you manually adjust your culture if tracking that in vintrace so that volume stays correct. The third method is a blend of the other two – using your starter culture as an additive linked to a treatment. Go to Winery Setup – Production – Additive to setup a new Additive for your ML Starter culture. Be sure to link that to the Start Ferment (MLF) treatment (referred to in option 2, above). 2. Start your barrel-down (Transfer to Barrel Group), use the inline additive (blue + on the right) to apply the “additive” to the wines. This should trigger the ferment and has the added benefit of recording the amount added to each barrel/group for historical reasons. 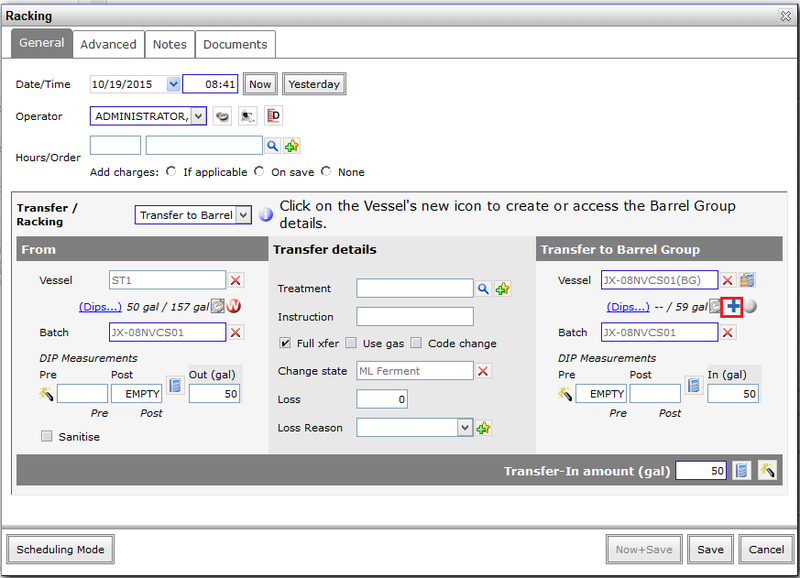 Remember to calculate the additive based on the total gallons/litres or barrels (if being added on a per barrel basis). Periodically, you should adjust volume on the culture if you are tracking that. 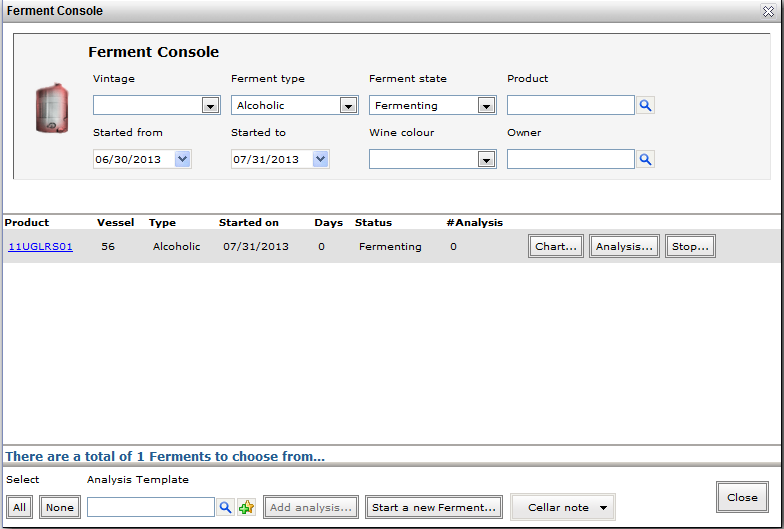 You can record an analysis for a single ferment from within the Ferment Console. Adjust the filters so that you can see the desired ferment and then click Analysis. The wine product and analysis template will be pre-populated. Ensure that you enter all measurements before clicking Save. 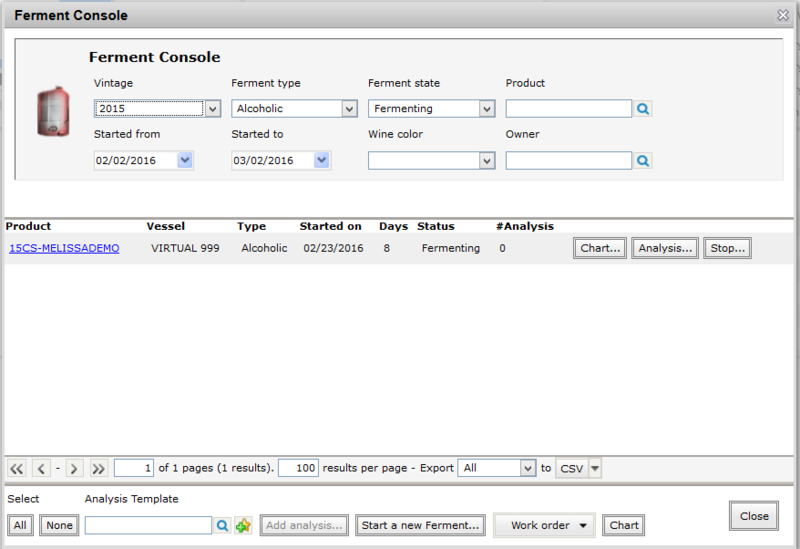 You may also record an analysis for the wine product outside of the ferment console and the data will still be viewable in all ferment-based reports. The system allows you to select a number of ferments from within the Ferment Console and enter analysis readings in bulk. 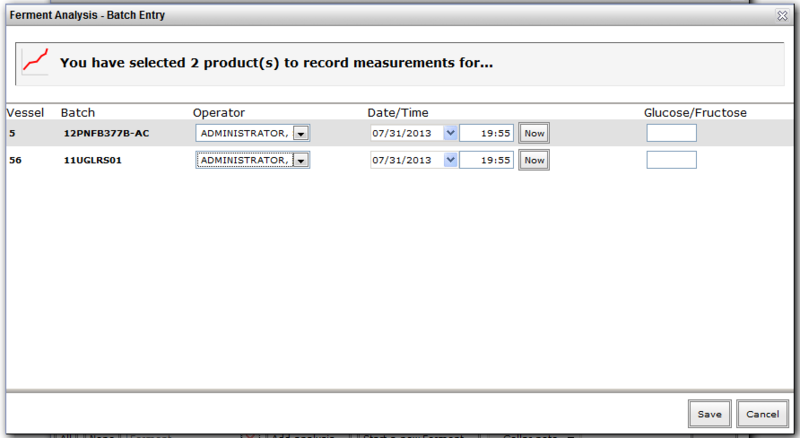 To do so, select each ferment that you want to record data for or use the All and None buttons. 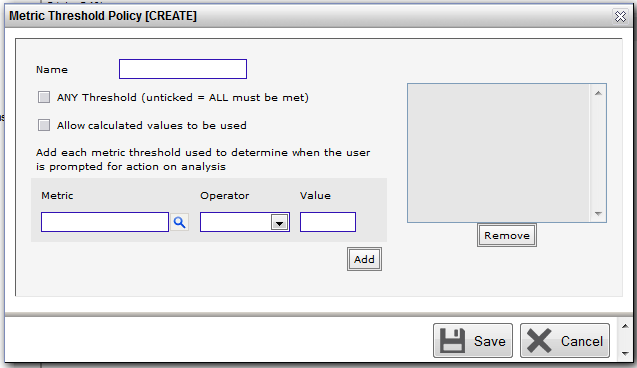 Select an Analysis template and click Add analysis… The Ferment Analysis – Batch Entry window will be displayed. Enter your measurements and adjust any date/times before clicking Save. Note: this method of entering analysis is independent of a worksheet and will not complete any outstanding cellar notes that you may have created. 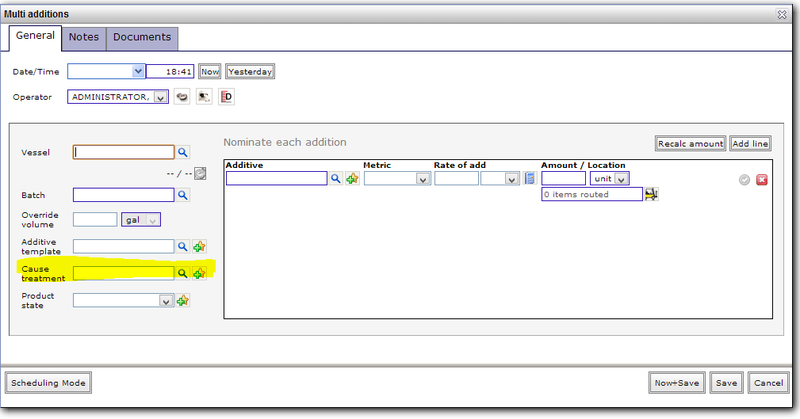 You can also use the Product search and Lab Console to request a lab test and then manage the data entry from there. vintrace is equipped with an advanced lab console that allows you to easily manage and enter lab results for wines in bulk. The lab console only shows wines that a lab request has been made for. To make a request for wines in ferment use the product search via File > Search > Bulk Wine search. Using the Ferment state field find all the “Fermenting” wines you want to sample before selecting the wines and then clicking the Lab Work button. 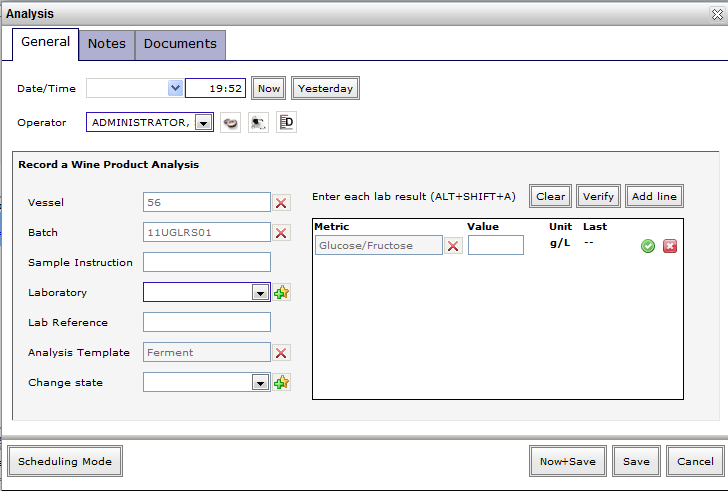 You can then request lab work to be performed and optionally print out the labels for the analysis. 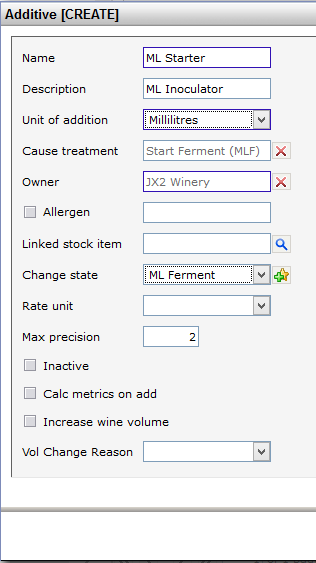 These requests will now be viewable in the Lab Console.The benefit of this approach over the Ferment console is that results can be Updated before being Confirmed, in the case where a senior winemaker approves results before they are saved against a wine. Another benefit is that you can easily produce a CSV (Excel document) to key the results in and then use the Upload function of the lab console to import the results (Sugar/Temp etc) directly into vintrace. Use the CSV button to produce an Excel document that can be filled out and then uploaded using the Browse and Load from file options. Alternatively, simply fill in the results onscreen before using the Confirm button (or Confirm All for multiple records) to save the results against the wines. 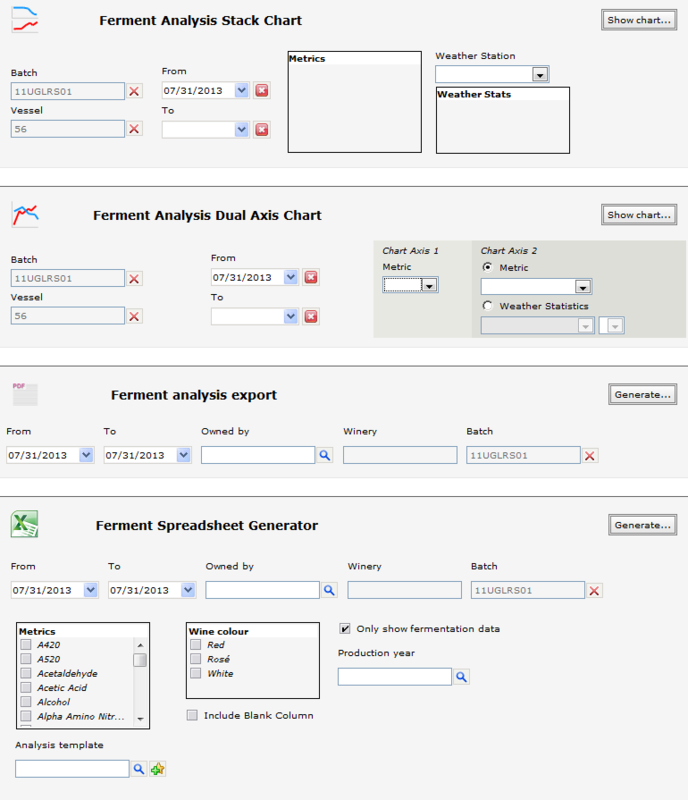 From within the Ferment Console select the ferment and click Chart… This will take you into the Winery Reports window with the ferment pre-selected for the report options. Here you can select your preferred chart/report and options before clicking Show chart or Generate to view data relating to this ferment. Configure a Stop Ferment treatment under Winery Setup – Treatment – Treatment (Ferment). Ensure the Start/Stop type is set to Stop ferment. When making a Sulfur addition to a fermenting wine you can select the Stop Ferment treatment manually on the Additions window. Or a better approach may be to configure an Additive Template for stopping a ferment that links in both your Sulfur addition and the Stop Ferment treatment together so that all you need to do is call up the Additive template on a Multi addition. Additive templates can be configured under Winery Setup – Production – Additive template and this would be our recommended approach for ‘automatically’ stopping a ferment upon a sulfur addition. 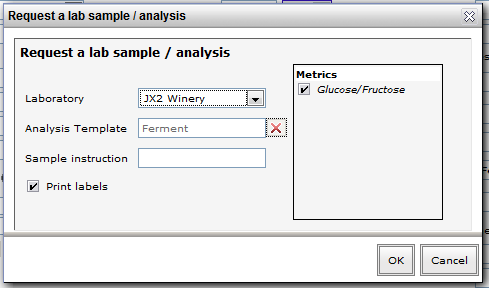 This feature prompts the user to stop a fermenting wine when an analysis is recorded if the results are greater, less than or equal to pre-defined metric values. 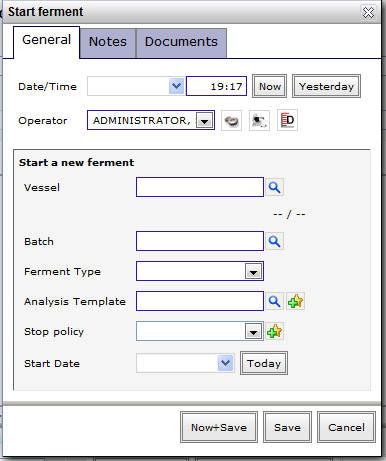 To configure a stop ferment policy open Winery Setup – Policy – Metric Threshold. If you require ANY of the metric values to trigger the implementation of the policy (stop a ferment in this case) then tick the ANY Threshold option. Leaving this blank will require ALL values to be met. 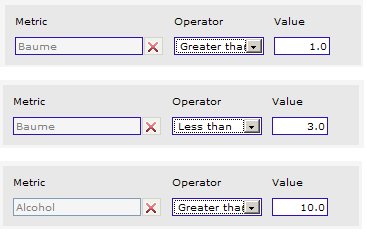 Select a metric, specify an operator (less than, less/equal, greater than, greater/equal or equal to) and a value. Click the Add button for each metric that you wish to specify. Your metric threshold policy for stopping ferments must be selected when starting a ferment or associated to any start ferment treatments. The stop ferment window will be displayed allowing you to specify the stop method or stop date. The stop method can be Natural, Pressure, Stuck, Temperature etc.